Submitted by yunyao on Monday, September 19, 2011 - 00:25. Mayori started with her favorite --- shrimp --- first. Tom enjoyed the cake itself too. 3. Mix all the ingredients and put into a muffin pan. 5. 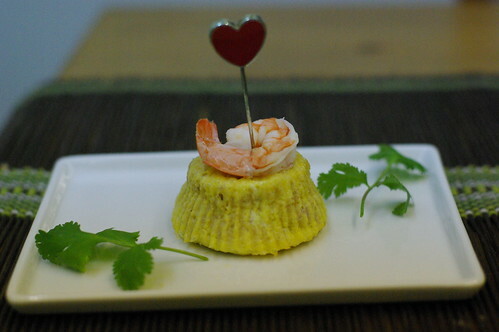 Garnish with a cooked shrimp (the easiest way is to put one or two shrimp into a cup of water in a tea cup. Microwave for 1 -2 minutes). Of course, I always pick something nice from this list as their birthday gift! this really heaped, its my cats sweet 16 today, and I'm baking them this! Happy sweet 16 to your cats! Hi, Katie, Thanks for the kind words and happy sweet 16 to your cats! Hope they will like it. I'm gonna bake this for Christmas!!! my babies will love it, thanks!! Baked this for my Milo's first birthday and now baking again for both of my Christmas kitties! I gave them a taste of the tuna before I put it in, and they've been waiting in front of the oven this whole time. Thanks for the recipe! It was his 1st Birthday! Thank you for letting me know. I am really glad that Tommy loved his special birthday cake! Happy birthday, Lily and Lucy! Hope you will enjoy your birthday party and love your special birthday cake! My cats name is lily too and i am making this for her!I thought that was funny how both of our cats names are lily! everything in the cake is safe and healthy for kitty bellies? my cat turns one on friday and this looks amazing. Yes, the eggs are safe! 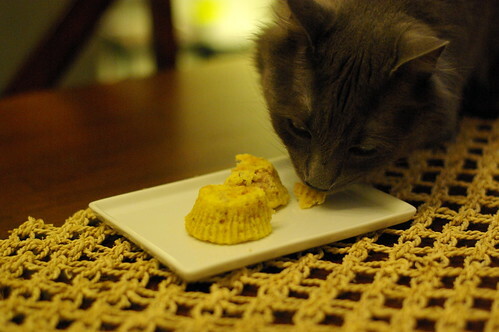 Cooked eggs are definitely safe for cats. 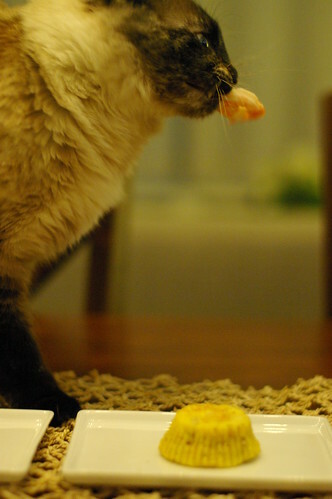 In fact, they are great food for cats and provide a lot of protein, vitamins and mineral. Thanks so much for posting this! I ended up making these for my kitten Goo and my 14 year old British shorthair Smokey and they both loved them! Thanks a ton! My cat, Emerald, is turning two and me being the crazy person I am is making her a cat cake. I'm the exact type of girl so do you know the exact measurements for the flour and cheese. I don't wanna give her too much but I don't wanna give her too little. For flour, you can add 2 tbsp. The exact measurement for the cheese really depends on how much Emerald like cheese. If she loves it, then you can add 1 or even 2 tbsp. If not so much, you can reduce it to 1/2 tbsp or less. Hope this helps and happy birthday to Emerald! my kitty oliver turns three soon and I want him to enjoy his birthday, I am having a party and everything! I just have a few questions. if you put whole wheat flour will it make a difference? and does it matter what type of cheese you add? Sorry for the late reply --- the spam software somehow misclassified your msg as spam. I am so exciting that you are throwing a party for Oliver. He is such a lucky kitty! Hope it is not too late yet --- using whole wheat flour should be fine. For cheese, you may want to choose the type that is suitable for baking, such as mozzarella or cheddar. Hope this helps and do share your party photos, if you can! How many kitty-cakes will this make? It's our kittens birthday soon and I would like to make a bunch to take to the rescue we got her from. That's such a great way to celebrate your kittens' birthday! --- It is so kind of you. The recipe makes 2 muffin size birthday cakes. So you may need to multiple the recipe depending on how many cakes you want to make. I am sure that the kitties in the rescue would enjoy it and hope they will find a permanent loving home like yours soon. was sent this link just in time! Today is my cat Vester's 13th birthday. My friend sent me the link this morning. I made him the tuna cheese cake snd he LOVED it! Thanks so much for sharing it! Thanks very much for trying out the recipe and stopping by to tell me. So glad to learn that Vester enjoyed the special treat made with love for his birthday! I have never tried it myself, but my guess is that you can replace the tuna with other cat canned food. I would try canned cat food that is mostly meat, such as Tom and Mayori's favoriate Weruva Paw Lickin' Chicken, for its favor and texture. Yes, the cake is suitable for adult cats of all ages. Happy 1st birthday, Cassie! 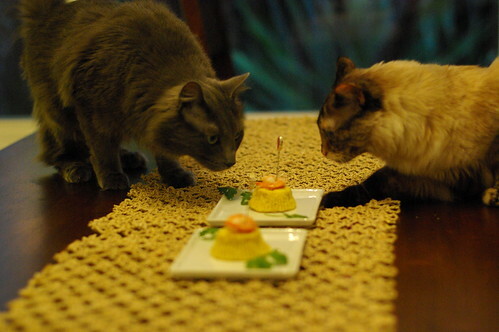 In the easy tuna birthday cake for cats, is it plain flour or self raising flour used. My baby girl Pebbles turns 1 tomorrow. I usually use all-purpose flour (a.k.a plain flour). Hope this helps and happy birthday to Pebbles! These are super delicious for humans too! So happy to know that we have one more happy birthday kitty. If I only wanted to make 1 cake thing, can u give me the EXACT measurements for each item. Please try the following amount and let me know if you have further questions. Thanks. It's lulus first birthday and I was wondering if you can use anything else instead of tuna in the cake ? You can use salmon or chicken but it has to be canned. it's just really great to have thsi so much nice tips. I just really wanna try it for my cat for sure at home. Its my boo's 21st birthday soon & ive been looking everywhere for a cake for her & I found your receipe!!! Thank you so much, I cant wait to make it for her & see what she thinks!! !